Why Outlook is the best email app for iPhone? The first and foremost reason for Outlook being the “pick of the day” is simply because it is user friendly and hence you find yourself getting comfortable with it in no time. Outlook is a smart email client which divides your emails in to two categories – Focussed and Others. Focused Category works almost in a similar manner like Priority Inbox of Gmail but this brainy email client will push those emails to the top which matters most to you. The other mails safely lands in the “Others” tab. Unlike other email apps, users can filter the emails in no time by using options like “flag”or ”unread”. The users don’t have the scroll down to find a mail but by just typing few letters you can find what you are looking for. This helps in reducing the search time of the users. Outlook gives you the flexibility to sync with other services wherein you can add or view attachments from any other cloud services like emai, Dropbox, OneDrive in just a click away. 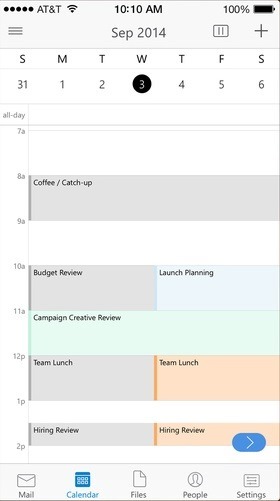 With Outlook you don’t have to leave the app or switch the app to view the calendar. 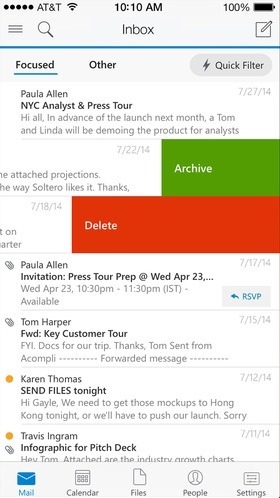 Outlook users have the option of setting up calendar for any events and sharing the schedule via emails. So don’t worry even if you forget the important schedules in your calendar Outlook will notify you. Another interesting feature of Outlook is that the users have the option of managing the notifications. On a daily basis users can set notification for calendar events along with new emails or you can email set notification for the important mails which you get in the Focussed Tab of Outlook. If you wont want to receive mails in between your busy schedule then you can even schedule the mails later so that it would land in your inbox sometime later. Visit the appstore from your iPone or iPad and install.